E. I. du Pont de Nemours and Company, commonly referred to as DuPont, is one of the world’s largest chemical companies. It was founded in 1802, and its stock is a component of the Dow Jones Industrial Average. John Krol joined DuPont in 1963 as a chemist and rose through the ranks to be its chairman and CEO. He has been active on many corporate and nonprofit boards, including Tyco International (for which we interviewed him for Triple Crown Leadership). Krol: Back in the 1980s, the world changed for DuPont because of globalization. We were very slow to move. DuPont was based on a military structure: very structured, lots of layers, and not particularly responsive. We had a lot of good things going for us, great R&D, a lot of great products, and a great history. When we hit the early 1990s, we thought we were changing fast enough, but we weren’t. We were way behind. So, over a period of about three years, we changed the whole company. When I say we, I was the vice chairman at the time, and Ed Woolard was chairman and CEO. In the process, we reduced the organization from about 140,000 people by about 40,000 (some of whom left with businesses we sold). We reduced layers of management. Starting with the first one, DuPont has been around for a couple of hundred years, so the values were pretty non-negotiable and clearly understood. The values were safety, care for people and the environment, ethics, integrity, and honesty. Second was operational clarity. We had an organization that was pretty autonomous. We had numerous divisions with their own systems. Everybody thought they were doing great. We had to change the organization’s mindset on what was important through metrics. We focused on five things that got drummed into the organization. We wanted leaders in the organization who could champion and implement these expectations, changing the culture. We thought it was a joke, but it wasn’t. He said DuPont was non-responsive, taking too long to make decisions, and too high-priced. He said they were going to go out of business if they stay with us. That turned the light bulb on. We started down the road of changing the whole organization. To increase the speed of decision-making and responsiveness, the first thing that we did was eliminate the division structure. We set up 17 strategic business units, each with a vice president in charge. There was only one layer between that person and me as the CEO. So, if you had to make an important decision quickly, I told them just to call me. If it’s really important, we could make the decision in two minutes over the phone. Not only did our decision-making speed increase, but our costs went down, and our prices became more competitive. Within about six months that same customer came back and said, “I don’t know what you guys did, but this is like a breath of fresh air.” We ended up keeping the customer, but we had to take bureaucratic layers out of the organization, eliminating the gatekeepers, who moved like molasses. We got speed into decision-making, speed into our responsiveness. The fourth was people. You have to weed out those who can’t get with the program. You don’t have time to try to bring them along because they’re like poison in the organization. DuPont was a $40 billion company with about 80 leaders at the senior vice president level. We cut those from 80 to 35 and in that process weeded out leaders who just couldn’t get with this new way of thinking. They were just blockers to the necessary changes. You have to weed out those who can’t get with the program. The fifth priority was having a vision and plan that the organization could buy into. It had to have credibility and longevity, not just short-range thinking. It had to be one we could clearly articulate without taking a book to explain, something simple enough to be easily understood by the total organization. Those were the five things that I thought were important to turn the organization from what was good enough 30 years before to one that could be a high-performing organization in the current world. Change is not an enemy, but an opportunity. Your questions made me think about how it felt to be in the DuPont organization, not just me, but my colleagues as well. One is that we felt a valued part of the team. Second, we felt like we were trusted. When we made decisions and changed directions, there wasn’t someone there second-guessing us all the time. Third, we understood the company’s values, and where the company was going. There was a clear understanding of that. We had clear metrics that we were being judged by, so there was always clarity and consistency in the plan that was being carried out as an organization. You call that alignment. Finally, we felt like we were winning. I used to say, “Fun is winning.” You feel good about yourself because you’re trusted. You feel good about your organization because we’re winning. And we felt that the overall organization is winning. 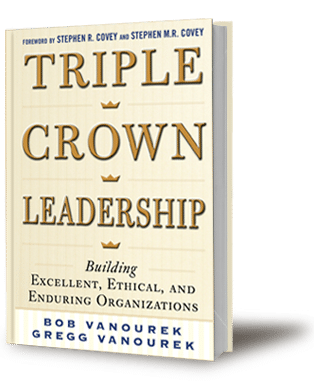 Bob and Gregg Vanourek are authors of Triple Crown Leadership: Building Excellent, Ethical, and Enduring Organizations (McGraw-Hill, 2012), based on interviews with 61 organizations in 11 countries.